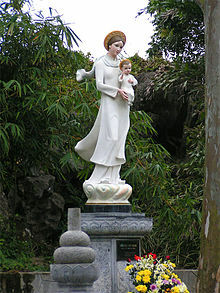 Our Lady of La Vang (Vietnamese: Đức Mẹ La Vang) refers to a reported Marian apparition at a time when Catholics were persecuted and killed in Vietnam. The Shrine of our Lady of La Vang (Basilica of Our Lady of La Vang) is situated in what is today Hai Phu commune in Hải Lăng District of Quảng Trị Province in Central Vietnam. http://www.stripes.com/blogs/archive-photo-of-the-day/archive-photo-of-the-day-1.9717/damaged-cathedral-in-vietnam-1972-1.146467 War damage to Our Lady of La Vang church, July 7, 1972. Source: Stars and Stripes. Fearing the spread of Catholicism, the Cảnh Thịnh Emperor restricted the practice of Catholicism in the country in 1798. Soon thereafter, the emperor issued an anti-Catholic edict and persecution ensued. Many people sought refuge in the rainforest of La Vang in Quảng Trị Province, Vietnam, and many became very ill. While hiding in the jungle, the community gathered every night at the foot of a tree to pray the rosary. One night, an apparition surprised them. In the branches of the tree a lady appeared, wearing the traditional Vietnamese áo dài dress and holding a child in her arms, with two angels beside her. The people present interpreted the vision as the Virgin Mary and the infant Jesus Christ. They said that Our Lady comforted them and told them to boil leaves from the trees for medicine to cure the illness. Legend states that the term "La Vang" was a derivative of the Vietnamese word meaning "crying out". Modern scholars believe it comes from the ancient practice of naming a location for a genus of a tree or plant native to the area, La meaning "leaf" and '"Vang "herbal seeds". In 1802 the Christians returned to their villages, passing on the story of the apparition in La Vang and its message. As the story of the apparition spreads, many came to pray at this site and to offer incense. In 1820, a chapel was built. From 1830-1885 another wave of persecutions decimated the Christian population, during the height of which the chapel in honour of Our Lady of La Vang was destroyed. In 1886, construction on a new chapel began. 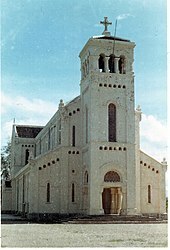 Following its completion, Bishop Gaspar (Loc) consecrated the chapel in honour of Our Lady Help of Christians, in 1901. On December 8, 1954, the statue of Our Lady of La Vang was brought from Tri Bun back to the holy shrine. The Vietnamese Bishops Conference chose the church of Our Lady of La Vang as the National Shrine in honour of the Immaculate Conception. La Vang became the National Marian Center of Vietnam on April 13, 1961. Pope John XXIII elevated the Church of Our Lady of La Vang to the rank of a minor basilica on August 22, 1961. Though there is no official Vatican recognition of this event as a Marian apparition, on June 19, 1998, Pope John Paul II publicly recognized the importance of Our Lady of La Vang and expressed desire to rebuild the La Vang Basilica in commemoration of the 200th anniversary of the first vision. In the Philippines, the chapel of Our Lady of La Vang is now the Roman Catholic parish church and national shrine in Puerto Princesa City in Palawan. Our Lady of La Vang has become a patroness of Puerto Princesa and patroness of Palawan. Our Lady of Vietnam Catholic Church on New Hampshire Ave. in Silver Spring, Maryland. Our Lady of Vietnam Catholic Church in Silver Spring, Maryland. "The Catholics of Viet Nam Pay Homage to Our Lady of La Vang". L'Osservatore Romano. Holy See. 1998-08-12. p. 3. Retrieved 2006-11-17. "As Pope visits Lourdes, La Vang Marian Sanctuary expected to receive 100,000 pilgrims". AsiaNews.it. AsiaNews C.F. 2004-08-12. Retrieved 2006-11-17.